Which Variety of Fremont Avocados Do You Have? I was raised having the privilege of enjoying an abundance of some of the most fragile, yet, hands down, the best home grown avocados ever at my parent's home in Sunnyvale CA. All that is gone now, and I have been searching for that rich tasting, thin-skinned avocado I grew up with ever since. However, the avocados I uncovered time and again during my search were never the variety we think is called the Zutano or Fuerte Avocado. Sadly, I was never sure of the variety because my parents weren't sure either. It seemed hopeless, and that those tasteful memories would never return. Both my parents, especially my dad being from Mexico, loved growing avocados, so it explains why we had two giant avocado trees. Just recently, I had amazing upturn of events. My long search is now over. Spread the news--Huzzah! I have found it at last. So how did I come to find the Fremont avocado? Let me share. I drive through Glenmoor in Fremont almost daily as a regular during school days because my kids attend Glenmoor in Fremont, and because my wife teaches there. Moreover, as a Fremont real estate agent, I always look at homes selling in Fremont--Glenmoor (Centerville), Irvington, and other popular Fremont real estate areas as I drive to and from my Fremont real estate agent office at Coldwell Banker http://www.Tricityhome.com, while passing through Glenmoor, I noticed an avocado tree owner carefully pruning and even covering his tree at different times of the year. A noble avocado grower because Fremont does get some frost. A couple of years went by. I watched him grow the Fremont avocado tree, then suddenly, out of the blue, he was chopping the tree down with no sign of turning back--cutting it right down to the stump. With my mouth agape, I turned to my son in the car and said, "We have to get to the bottom of this." I turned the car around and rolled to a stop next to the gruesome scene. As I approached the avocado grower, I noticed what appeared to be a single fallen fruit on the well manicured lawn. He was a nice man, but why he had cut the Fremont avocado tree down did not make sense to me. After a few pleasantries and pointed questions from my part, he began to tell the story. He did not know the name of the variety either. He felt that the avocados started roots in the fruit while they were still on the tree and that the sprouting made it non palatable for him. That sounded familiar. And, top that off with hard work Fremont avocado trees need from everyone who owns one, and you get a frustrated avocado grower. If only I had known what was going on in his mind a few months ago and if I knew this in fact was the correct variety, I would have easily negotiated removal of the tree and paid a tree removal service to replant and grow the avocado tree at my Fremont house. Or, at least share tips and tricks for enjoying this temperamental variety and explain how to get it just right. I lowered my head to see if I could glean something from the wreckage. There it was, an abused, omitted avocado, unencouraged and lying there. It looked beyond saving. It was evident that even the birds had a go at it and left it for not. I told my son to take it and handle it carefully, not knowing this was the prized fruit of my youth. But, just in case, I wanted to save it from the all to certain destination of the green, Fremont waste garbage bin. My son clutched it carefully with his small but certain hands and we both headed home in the car. I began telling the stories of the best avocados ever to my singular captive audience all they way home. Perhaps a week went by as a few oranges and garlic bulbs in a big blue bowl willingly squeezed aside to make room for the bruised and battered avocado welcoming it to a new home. Over time, nature had its way and the hardness of the green citrus eased up and lent itself to becoming softer. Even the skin changed its look from having shiny and stretched looking pock marks changing ever so slightly into wrinkled and almost dry in appearance. I often caught myself engaging in long stares onto its skin while carefully clutching the slowly changing green orb. That last noticeable change was all too familiar. I performed the thumb test. It was ready to eat. Words, at least mine, cannot convey the delight I felt. Even though I second guessed myself a few times, my wife was right there to concur that this was in fact the right variety of avocado we all coveted. Call it what you will, but we will name the variety as one Zutano/Fuerte. I almost started story telling to my long-suffering wife who has heard over and over, "I miss mom and dad's avocados... Remember the time when I had to climb the tree..."
It takes years for a young avocado tree to bear fruit. Heaven knows I have tried--only to discover that it was the wrong variety of avocado. As the bearer of the fine fruit must almost always wait for the avocado to become ready to eat, patience is what all avocado lovers must endure. 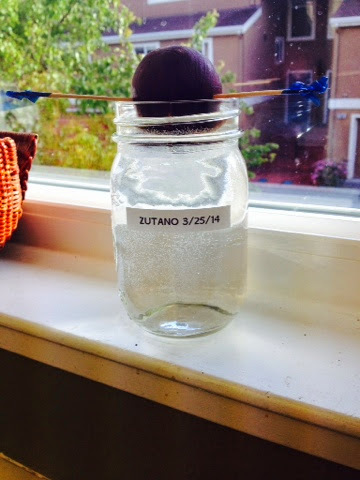 There is nothing really fast about an avocado tree accept during its mature stages. Then you soon realize that they never stop growing, and their speed of growth increases significantly. But alas, my parent's prize avocado trees and now the nurtured Fremont Glenmoor tree were gone, never to blossom again. I may have found the fruit, but my hope of ever learning the right variety were dashed. Or, wait a minute... Perhaps not. I now have one undeniable seed of hope, the seed itself.